Kerala is facing a major health crisis at the moment with Nipah Virus claiming several victims. [Details on NDTV] Nipah Virus symptoms are also reported in neighboring Karnataka's Mangaluru [Prajavani News]. With no cure and no sure shot way of protection against the infection, this development certainly affects tourists heading to Kerala. Though it is unfair to assume everyone going to Kerala faces a great risk of getting killed by the Nipah Virus, leisure travelers often prefer to be safe than sorry. A colleague of mine had planned a family trip to Kerala- he had booked 3 return tickets on Indigo by paying around 28k INR. Because of this Nipah outbreak, he decided NOT to go to Kerala right now. Under the current Indigo cancellation policy, he stands to lose close to 25k. Only some airport tax component will be refunded. Though this is standard airline policy, whenever there were an emergency airlines have been flexible to offer full refund or free of cost rescheduling to a future date. This is done in exceptional cases like floods, heavy rains or other such activities disrupting normal life and making travel difficult. Unfortunately Airlines haven't taken a decision yet on Nipah virus scare. If you have a ticket to Kerala but don't want to go right now, no special consideration for you. Go at your own risk, or lose money. I feel Airlines should allow a free rescheduling or full refund to passengers who have booked tickets to Kerala/Mangaluru in May and June 2018. (For July n future dates decision can be taken in mid-June based on latest developments)- There're only 3 airports in Kerala- Kochi, Trivandrum and Calicut. Airline call centre guys can't decide this- someone higher up in the management need to take the decision. Kerala being a tourism dependent state, such tourist friendly policy and measures are critical to retain trust and favor of tourists. Kerala tourism should work with airlines to be generous on tourists heading to Kerala but keen to postpone their trip. If any tourist dies due to Nepah, it will be a PR disaster for Kerala tourism. 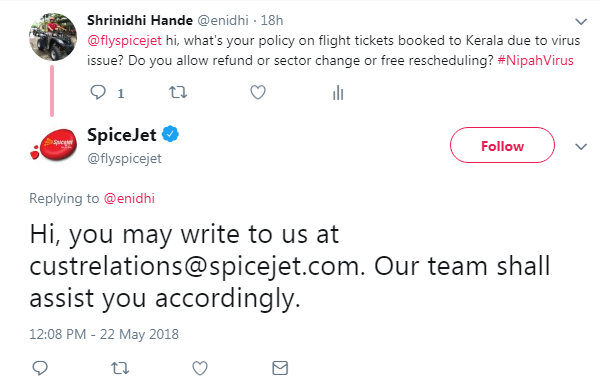 I checked yesterday on twitter with few airlines- they all gave standard replies, which confirmed they don't have any special policy as of now for Kerala's Nepah virus incident. I hope airlines will take a passenger friendly decision soon. Indigo offered my colleague a rescheduling at a fee of 5k, which we find expensive, considering that flights in say August/September are lot cheaper than the amount paid during last minute booking done for May end. Related: Government is pushing a more generous cancellation policy- 100% refund if cancelled within 24 hours of booking, cancellation charge otherwise to be max of base fare + fuel surcharge or Rs 3000 whichever is lower. [Details] Hopefully this should be implemented soon. Yes, all flight operators covering Kerala during May and June 2018 should take exceptional view to this natural event resulting into risk and fear among the travelers. Any airline taking the lead will be the leader is customer centricity and customer satisfaction, which is the backbone of airline and tourism industry. #Vistara is charging INR 3500/- per passenger per sector for cancellation. #Indigo is charging INR 3000/- per passenger per sector for the cancellation. This, for Kerala should be exempted, as a gesture and genuine cause which is not in hands of anyone, neither the customer nor the airline. It will boost the goodwill and tourism in mid to long term. Under present scenario, it is not possible for many of us to travel to Kerala and put life at risk. Considering the virus spread in Kerala as special case, airlines should waive off the cancellation charges for the passengers.As in this critical situation they are left with no choice but to cancel the flight. Due to Nipah virus, it isn't possible for us to travel to Kerala, in such circumstances, when the source and treatment of the virus isn't identified. This is not just a personal issue, rather something which concerns the whole country. Passengers shouldn't be charged the cancellation fee. Cancellation should be made free of cost, for this is an acceptable reason. Please cancel the tickets free of cost as a one-time good will measure. All airlines should not charge any cancellation charges. Thanks for your support. Yes, airlines will earn lots of goodwill if they show sensitivity and give full refund. The issue seem to be contained for now- hopefully it won't resurface.